Great value and even better tone on this mint condition Grosh! This guitar kept me at work after hours, it was so good I just couldn't put it down. It has a huge and powerful sound from the first chord you play unplugged, and that humbuckers screams and barks with a full and rich range. Clarity all across the register and insane playability has made this my new favorite s-style in the shop, hands down. Plus, I love the look of the blank fretboard, super classy and super fun to play! 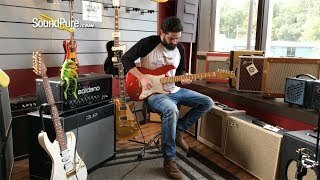 In this video, Sound Pure electric guitar specialist Michael Buckley plays a Grosh NOS through a Soldano Hot Rod 100. The ultimate "traditional" strat-style instrument with unmatched tone and playability. Very similar to our Retro Classic in tone, the NOS Retro combines the traditional "S" shape and features with the unmatched construction, tone and playability of a Grosh. The NOS Retro features a true "S" body shape, vintage pickup routing and traditional truss rod construction. For the player who must have the look and features of a traditional strat-style guitar but demands the ultimate in tone and playability, it doesn't get any better than the NOS Retro. And like every custom Grosh guitar, the NOS features master-grade, tone-tapped woods, ultra-thin nitro-lacquer finish and handcrafted Grosh pickups. Pure Passion - Pure Tone.